Cemeteries, for most people, are places of foreboding – we understand that we too shall end-up, here. Beyond the fact that we usually find ourselves at cemeteries on the other side of saying goodbye to loved ones and good friends, cemeteries also point us to the consideration of the life we are living. At our life’s end, we may be more in a state of regret having conformed our lives to the expectations of others, failing fully to step up and into the Life that is truly ours. On the other hand, on our death bed, it would certainly be something to smile, roguishly, and to own to others that we’d certainly taken ‘a good squeeze out of life.’ My wife’s friend from church, Herman Peters, passed away a week or two ago and his funeral and eulogy embraced his feisty, roguish approach to Life and seeing it through well. Herman’s eulogist, throughout his eulogy, would often lean over and look at Herman within his casket and ask, “Do you think it would be okay if I tell them about the time we did…?” Wow! What a way to go! Good schtuff, Herman – thank you to who you have been to all others and the friend and elder you’ve been to my wife. John O’Donohue and his Greenbelt lecture on the Imagination have been much on my mind as I’ve considered this photograph, tonight. Listening to Pierce Pettis sing Love Will Always Find Its Way from his album,Everything Matters; other good, good songs include Neutral Ground and Just Like Jim Brown (She is History). Thanks for stopping by my blog today. I’m glad you did, I’m going to enjoy yours! Nice picture – the mood of it comes out really nice in B&W. 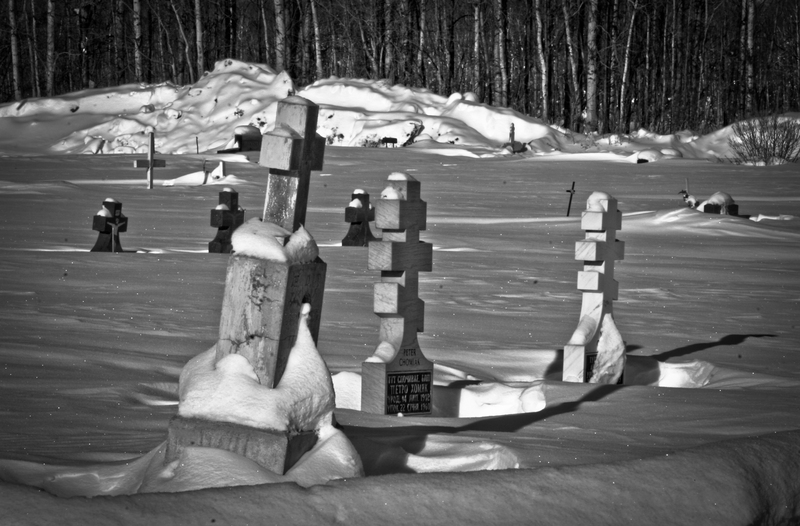 And you see lots of cemetery shots – but rarely have I seen one in winter.. nice change! !